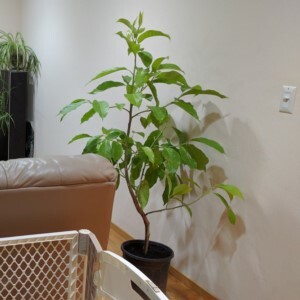 My journey with the Michelia Alba started when I complimented my parents on their new indoor potted plant. I had no idea the name of the plant, but found it unusual, but amazing that a tree could have flowers with such a strong fragrant smell. I wanted a branch to soak in water in hopes of propagating another plant. Little did I know they would find a local nursery and outright buy me one. After I found out the plant cost $80, substantially more than the $15 I spend at Lowes or Home Depot) and was grown from a naked stick legally imported from Asia, I decided I should do some research to make sure I'm doing everything right. The simplest place to start looking is online. I've put together some facts during my research that may benefit the first timer to this plant. Also known as white campaca, white sandalwood, white jade orchid tree. Grows in US Department of Agriculture plant hardiness zones 10-11. Has cream white flowers with 12 tepals. Root problems arise in constantly wet soil, better to let the surface roots dry out before watering again. Young trees N-P-K ratio of 15-15-15 while established trees have a N-P-K ratio of 7-9-5. Benefits from a mix of full sun and indirect sunlight. Mealybugs can find their ways on leaves, but can be washed or wiped off. Can be grown indoor in a pot or outdoors. Windy areas are not optimal, as branches can easily break. Grown outdoor with long healthy root system can result in 20-30 foot tree. Germinated from a seed, it will take between 8-10 years to flower. My plant is quite large already. It probably about 5 feet tall and 3.5 feet wide. Most of the leaves are healthy with a handful of leaves possibly munched on by insects. I've decided to put the plant in a mostly cool area with lots of indirect sunlight all day. The instructions from the nursery was to water once every 3 days while the plant gets accustomed to it's new environment and light source and not to repot it right away. Leave it in the ugly black plastic planter. I will report back with another post in a couple of weeks or if there's something new to report. A Michelia Alba plant, also known as a white champaca, white sandalwood, or white jade orchid tree, is a plant commonly found in Southeast Asia. It's primary features are large wide leaves and very fragrant white flowers.